Did you know that as a result of chemotherapy and radiation, children often develop learning disabilities. When these young survivors return to school, parents and school personnel may be unprepared for the child’s cognitive and social deficits. The children may not able to keep up with their peers, fall behind academically, and may experience rejection and social isolation. 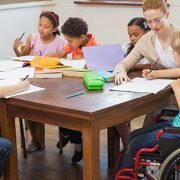 Making Headway offers free-of-charge educational counseling to address the adjustment issues related to the children’s learning disabilities and difficulties in returning to school, as well as their rights under Federal law. This is just one of many programs operated by Making Headway to help children diagnosed with a brain or spinal cord tumor. Learn more about this program at http://makingheadway.org/care/#educational.